FREE Custom Xbox LIVE Gamercards for Xbox 360 now on 36.. 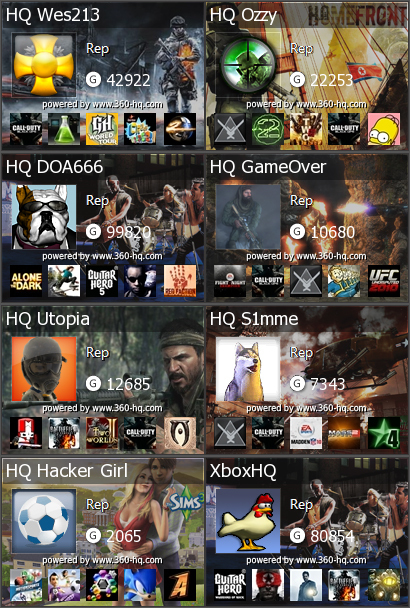 The new 360-HQ Xbox LIVE Custom Gamercards system (BETA) provides all registered 360-HQ members with custom, one-of-a-kind Xbox 360 gamercards for all sorts of uses. Embed them in your signature, add them to your facebook or even place them on your desktop. Our new database driven gamercard system will soon let all HQ users design and submit their own gamercards for the community.. So, if you're a budding young artist, or even an old one, you can download our sample .PSD photoshop file from the official forum thread/topic here and start designing.